Since our trip to Anna Maria Island last year, Florida is a state that has continued to surprise us. 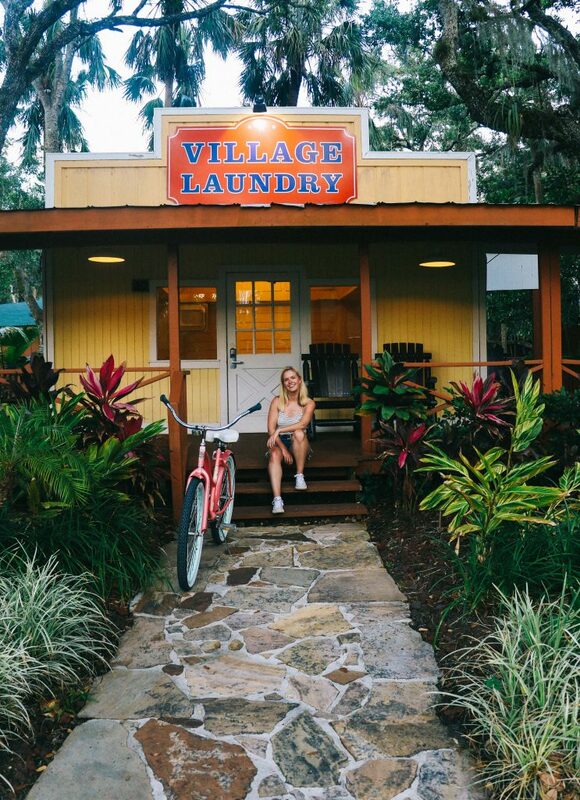 A sleepy, pastel-coloured haven located off the Gulf of Mexico, our week on this idyllic island revealed a very different side to the sunshine state; one that made us wonder if there was more to Florida than we had first thought. Just a few months later and our suspicions were confirmed – our road trip around the state revealing more than one surprise. From dynamic Tampa and St Pete Clearwater, to beautiful Crystal River, it became clear that Florida is indeed immensely diverse: offering fragile ecosystems, thriving cities and colourful, artisan communities. However, there was one stereotype of the ‘sunshine state’ that we knew must be true. Indeed, it was one confirmed to us during our once-in-a-lifetime trip to Universal Studios in January 2017. You see, Florida has a well-known super power, a skill recognised throughout the world: the ability to make dreams come true. Importantly, it’s not only children who can benefit from this magical power (something we had discovered during our week at Universal Studios). Indeed, enter one of Florida’s parks aged thirty, and long-forgotten childhood dreams of walking the streets of Diagon Alley will almost certainly come true. In allowing visitors to escape the pressures of reality, Florida is the master of magic and surprise; and it seemed it had one final surprise for us, too. Throughout our week in Florida, we had been carrying with us a set of crumpled envelopes: each detailing our itinerary for the next day. As the week passed, we gave little thought as to what might be in the final two envelopes, until that final Friday that is. Hastily opening the folded paper, we read the bright pink lettering aloud: ‘It’s time to make your childhood dreams come true. You’re going to Walt Disney World!’ We stood silently dumbstruck. I could have sworn a tiny constellation of glittering stars were surrounding us. 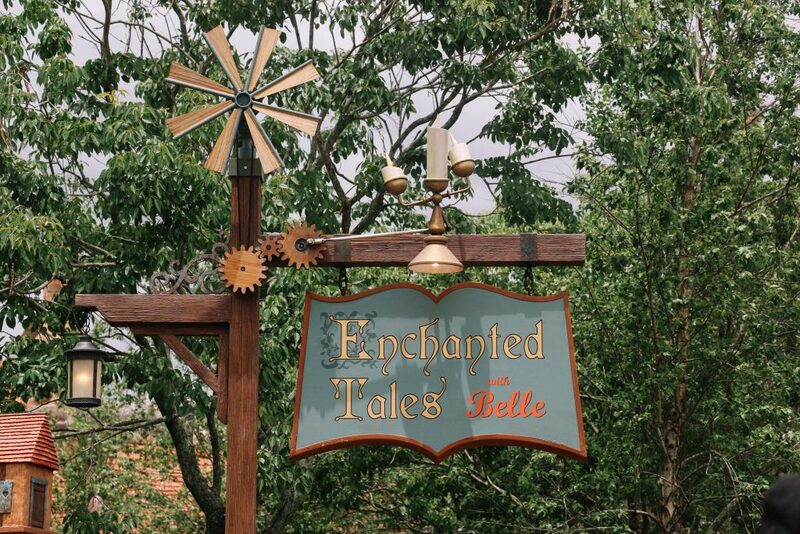 Yet, before we could walk through Disney’s shining gates, our itinerary had one final surprise: it seemed we would be visiting the rolling hills of Florida’s Wild West. Making our way up from St Pete, Clearwater to Walt Disney World, we took a small detour. 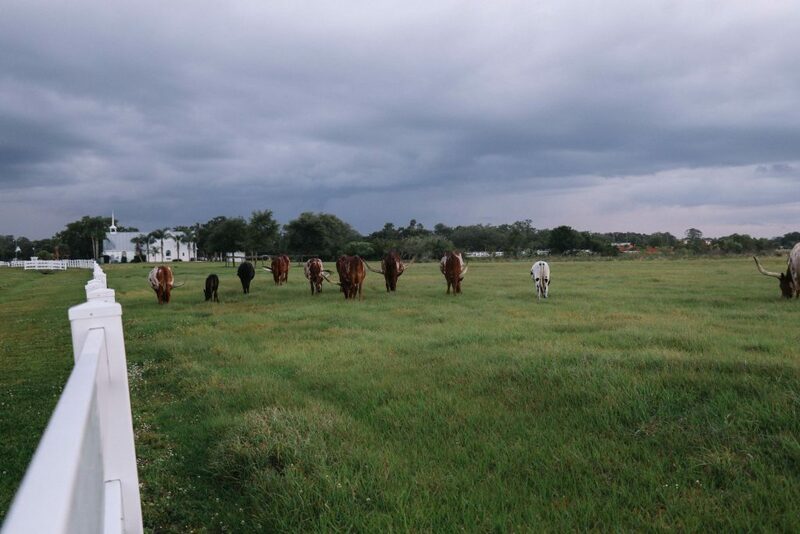 For one day – and one day only – we were to become cowgirls, thanks to Westgate River Ranch: a fully-fledged ‘dude’ ranch located south of Orlando and the biggest of its kind east of Mississippi. A ‘dude’ ranch, we discovered, is a working ranch that allows guests to stay and experience a slice of American, western-style living. 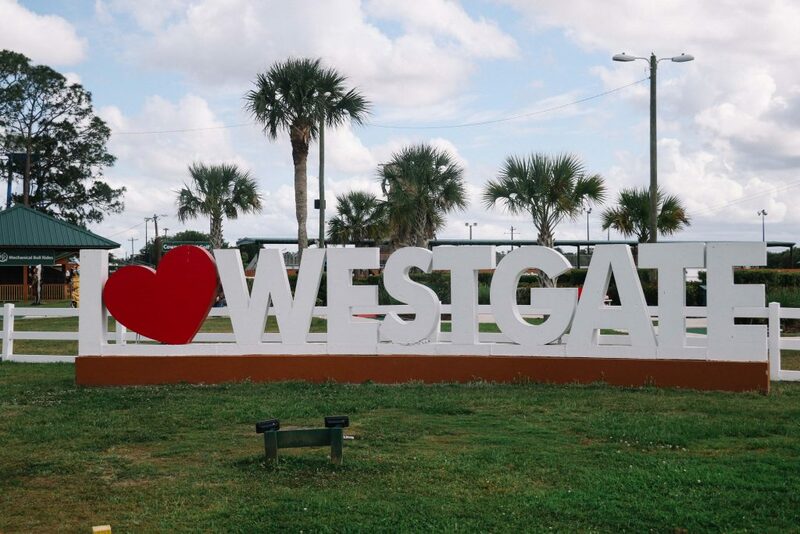 For those seeking a slower way of life, Westgate promises a slice of ‘old Florida’: pulling you back to a time when the state was frequented by cowboys and cattle ranchers. Indeed, the area now known as ‘River Ranch,’ was once a resting point for ‘cracker cowboys’ during their lengthy cattle drives across the state, as they headed south. As children, we harboured a fascination and love for horses – waking up early every weekend to spend our Saturdays at a working stables. Arriving in jodhpurs and clutching our tack boxes, we’d spend our weekends caring for the horses in return for a few ‘hacks’ through our very own Buckinghamshire wilderness. With vivid imaginations, we’d cross these dangerous ‘wildernesses’ of local fields, pretending to round-up the resident sheep with shouts of ‘Yehaawww‘. To most onlookers we looked entirely mad, but in our minds, we were real-life cowgirls. As our jeep pulled up outside our home for the night – a ranch themed Deluxe Suite – we were almost overwhelmed with excitement. It was like we had stepped foot inside a wild-west movie. I just wished I’d brought a pair of cowgirl boots with me. Having settled into our room, we headed to the stables for a lazy hour of horseback riding. Slightly creakier than the last time I rode (aged 12), I clambered up over my horse and sat back. The sun was high in the sky as we rode some of the 1,700 acres of the estate, the only sound coming from the gentle sighs of our horses. The hour-long hack was just one of the western style activities you can experience at Westgate River Ranch. Other activities include: airboat and swamp buggy rides (something I would certainly have done if we’d had the time), tractor hayrides and fishing in a ‘catch and release’ pond. Walking a little gingerly after our horseback experience, we grabbed some bikes (which are free to use on the ranch) and set off to explore more of our surroundings. Turning the corner, we entered into a picture-perfect, wild west inspired ‘village’. With the sun beginning to set and lingering Spanish Moss making the scene even more atmospheric, we sat back in two rocking chairs and sipped from bottles of beer. We were in our very own slice of the Wild West. 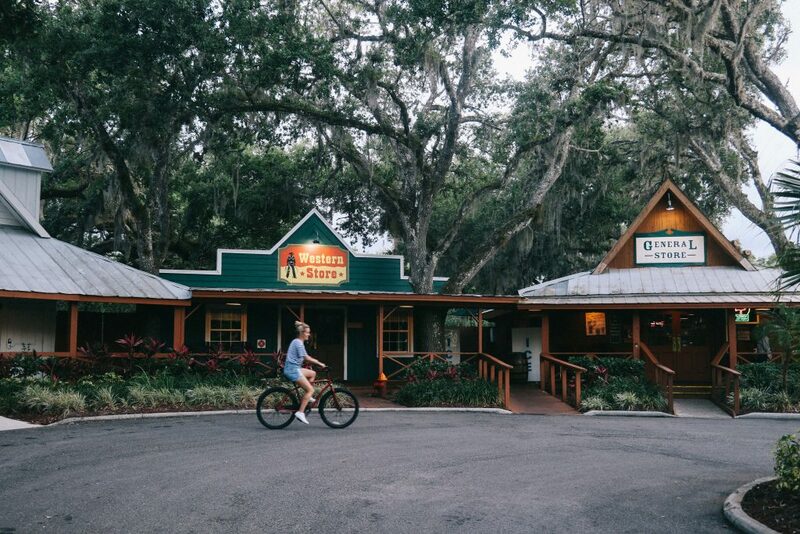 Westgate offers numerous places to eat on site, including the Smoke House Grill for lunch and dinner, a general store (ideal for those self-catering) and of course, the local Saloon. Aside from the traditional cabins, Westgate also offer luxurious glamping options, including giant teepees that looked to be every child’s fantasy. Westgate River Ranch really was the place of our ten-year old fantasies, and although it took a subsequent twenty years to find, it was well worth the wait. It may have only been a flying visit, but it was the perfect precursor to our final destination on our Florida road-trip: Walt Disney World. Rising early on our penultimate day in Florida, we gazed out at the sunrise taking place across the ranch and gave a silent ‘thank you‘ to the universe. After 32-years of waiting, today was the day when one of our most wished for trips was to come true: Twins That Travel were on their way to Walt Disney World. In a panic not to waste any precious moments in the parks, we threw our clothes into our suitcases, waved goodbye to the horses and jumped in the jeep for the hour-long journey north to Orlando. Approaching the parks, the Disney road signs becoming ever more frequent, I tried to suppress an excited shriek. Dazzled by the number of parks offered by Walt Disney World (Animal Kingdom, Epcot, Hollywood Studios and Magic Kingdom, as well as two water parks), we headed down the final highway to our first stop and home for the night: Disney’s Grand Floridian Resort and Spa. Our Disney experience began as we checked into Disney’s Grand Floridian Resort and Spa: a hotel that was every bit as magical as the the Disney Castle itself. Victorian in design, it is the park’s flagship and most luxurious resort, and was an undoubtable highlight of our visit. Mildly frazzled from our drive, we walked through the doors of the Grand Floridian and were met by the sound of a live pianist, alongside the intoxicating smell of vanilla and peonies. It was a sensory overload. Stopping dead in our tracks, the incessant SatNav still muttering directions in my hand, we stood mesmerised by the five-storey lobby, complete with traditional caged lifts and ticking grandfather clocks. We hadn’t set foot in the parks yet, but were already transported into a Disney fairytale. If I was not so British, a small tear may have leaked from my eye. Quickly escorted from reception by Doug – one of the kindest and most accommodating persons we’ve met yet on our travels – we were led to our room. Stood mutely at the foot of our fairytale beds, Doug attempted to show us around the room; politely ignoring our stunned silence. 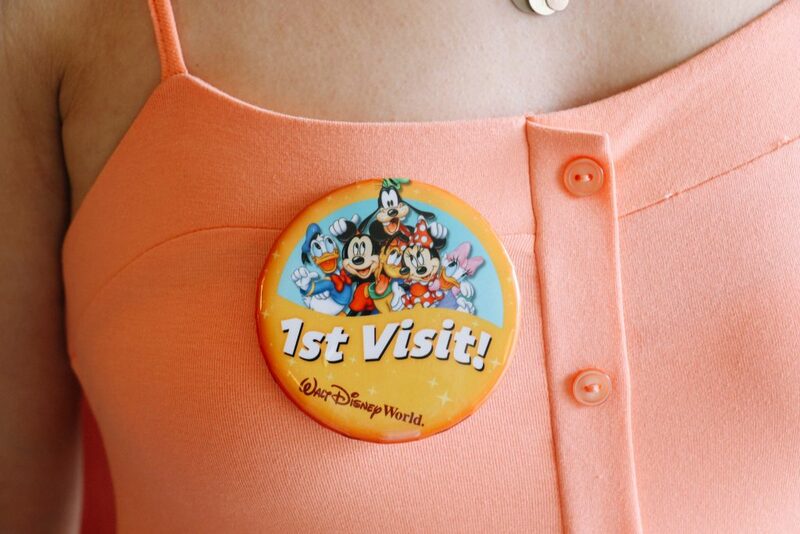 “You’ll also want to make sure you wear these”, he said – handing over what is now perhaps one of my most prized possessions: a ‘1st visit’ badge. Immediately attaching it to my dress (and taking several hundred selfies to send to friends and family), I finally sprung into action. There was no time to waste: it was time to explore the parks. (For those intending to stay offsite, Orlando hotels can be viewed here). 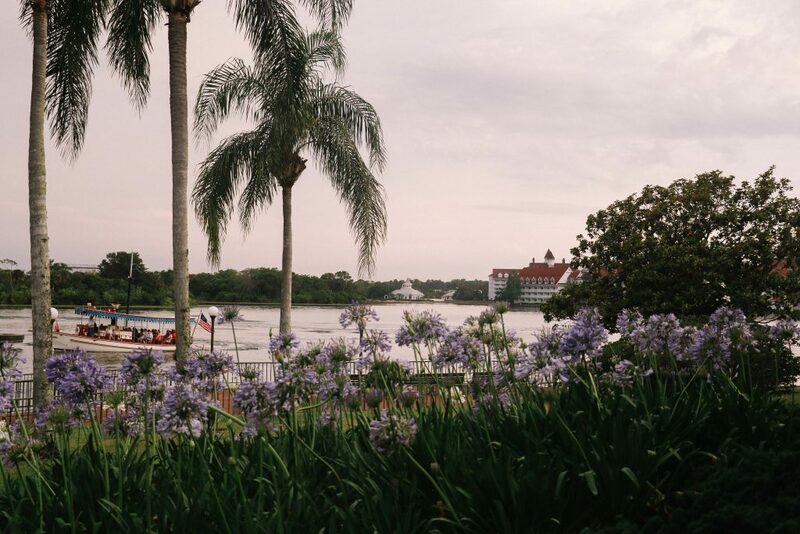 One of the key advantages of staying at the Grand Floridian is the ease with which you can access the parks. With a monorail station found on the second floor of the hotel, and a boat to and from the Magic Kingdom, it was just a ten-minute journey into the park from our hotel room (a perk certainly not lost on two Disney addicts who had just 24 precious hours to explore this world). Due to our limited time in the parks, we were kindly given ‘FastPass+’ tickets, which were uploaded to our handy Mickey Mouse shaped wrist straps (used for accessing the parks). For those looking to exploit their time in Disney World, alongside experiencing the majority of the rides, fast-passes come highly recommended. Cutting queuing time by often over an hour, our fast passes enabled us to whizz on and off of rides quickly, with little waiting around. Prior to arriving at the parks, I also downloaded the Walt Disney World App, which was surprisingly useful. 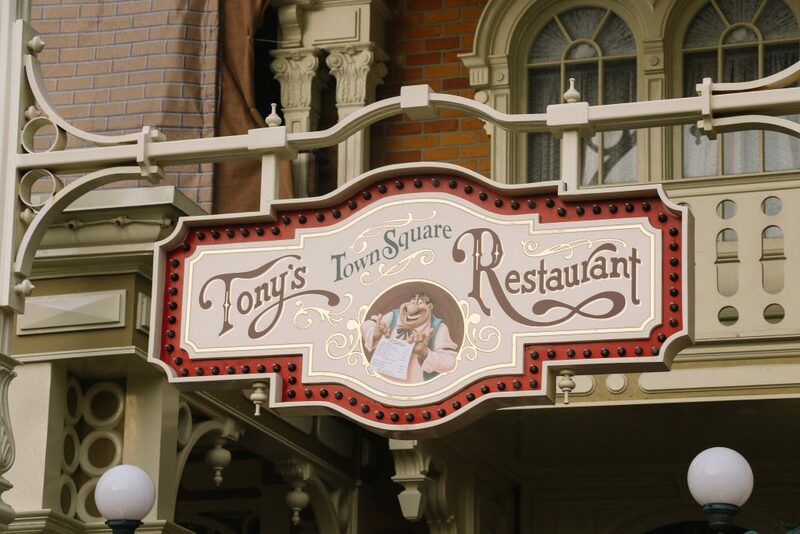 As well as showing you live wait times for rides and offering an interactive map to navigate the parks, the app also allows you to make lunch and dinner reservations across the parks’ many restaurants. This was perhaps the most useful feature of the app and is something well worth using. Marching through the gates of the Magic Kingdom we (for the third time that day) stopped abruptly in our tracks. 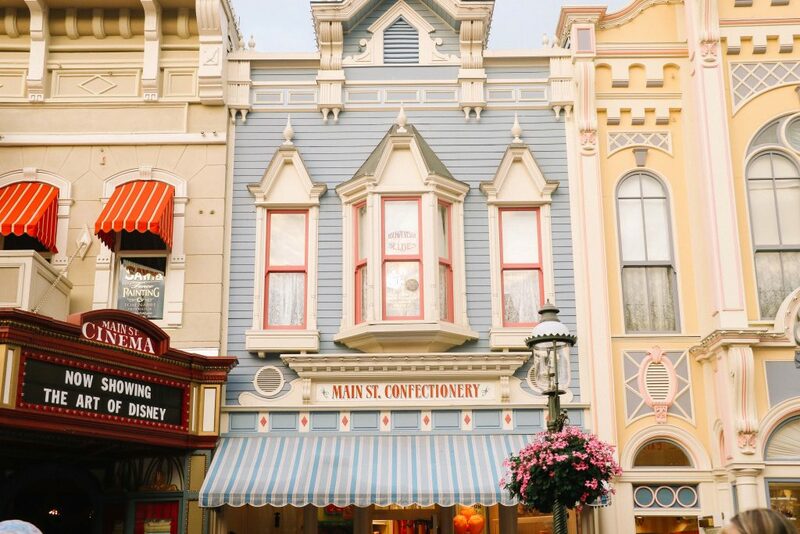 Ahead of us was a Disney wonderland of pastel coloured buildings, shiny balloons and a path leading to the most iconic Disney emblem of all – Cinderella’s Castle. Stood in front of it, the midday sun reflecting off its gleaming spires, it was the perfect welcome to another of Florida’s magical parks. It took us less than ten minutes to feverishly buy our Disney essentials, emerging from a store with sequinned Minnie Mouse ears and a Mickey Mouse balloon. 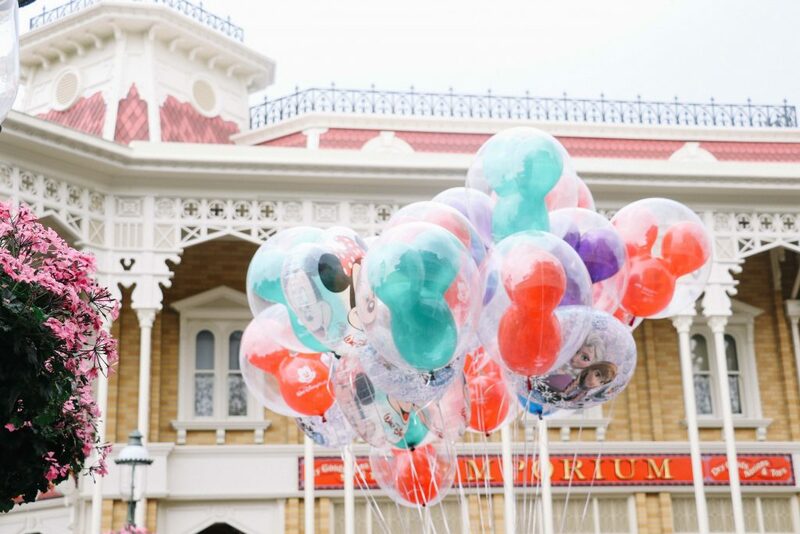 With both of us jostling to hold the balloon, we moved quickly through the crowds as we headed to some of Magic Kingdom’s most famous rides (including Space Mountain), before eating lunch at Gaston’s Pub. Munching on my food – the Beauty and the Beast soundtrack playing gently in the background – I found it hard to remember a time when I’d ever been happier. Prior to visiting the park, we knew very little about Epcot – aside from Laura vaguely suggesting it was perhaps a golf course given the giant ball-like structure at its entrance. Our second stop after Magic Kingdom, I too was a little dubious as to whether our time was best spent visiting this park. With only a handful of rides, we were both unsure as to what it had to offer. 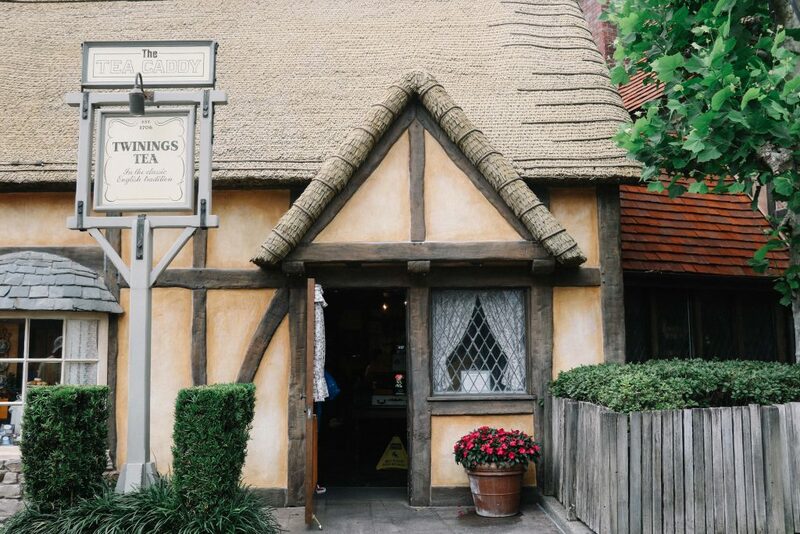 Yet ironically, it turned out that Epcot in fact offers the world (quite literally), thanks to its ‘World Showcase’ that celebrates eleven nations in the form of walkable, bitesize countries. Wandering through Paris, before suddenly arriving in the crowded souks of Morocco, Epcot offers a visitor experience unmatched by any other Floridian theme park. I loved it. 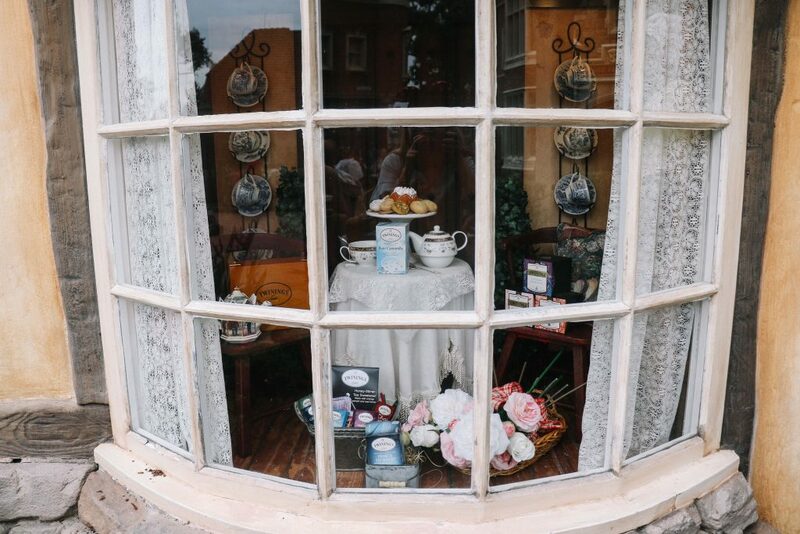 “We’re in England”, Laura yelled, moving at high speed towards a small Costwolds- inspired cottage. Surreally, I followed after her, weaving through what felt like a familiar country village, complete with a pub a Twinings Tea room. Indeed, the only thing that betrayed this perfect English microcosm was the weather: the humid, 30-degree heat suggesting that we were no longer in the UK. Three hours melted away as we moved seamlessly between countries and cities – each offering their own unique stores, cafes and restaurants. From a Japanese store selling back scratchers and panda-inspired face masks, to French perfume shops stocked with expensive cologne, we explored it all. Dare I say, we had more fun here than anywhere else in the parks. 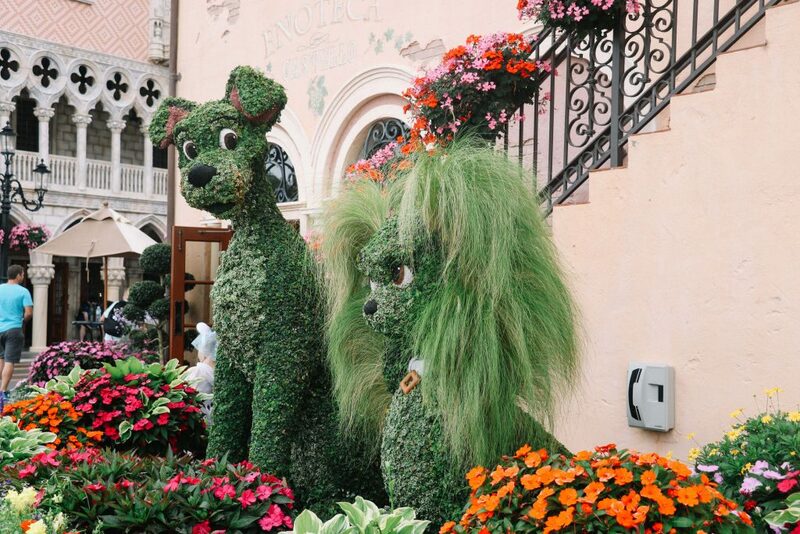 The other unexpected surprise at Epcot was its intricate flower displays and curated gardens; the park running an annual International Flower and Garden Festival to celebrate these features. 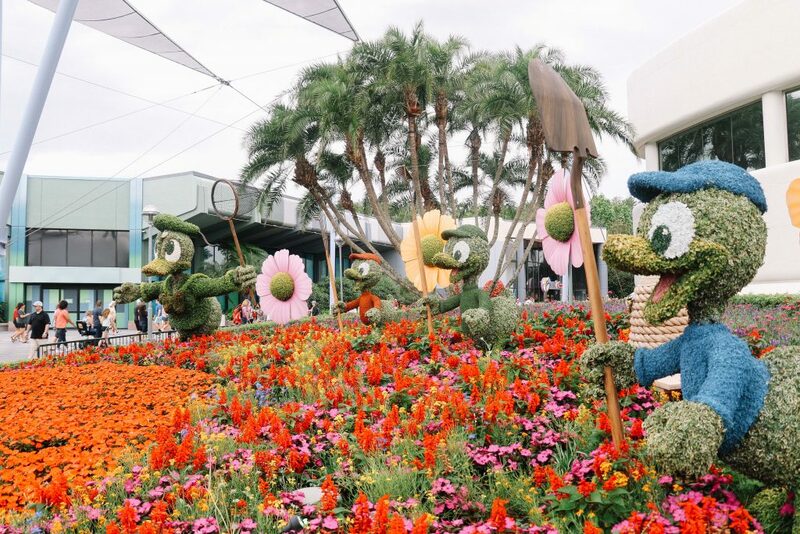 Again, unlike anything found in your usual theme park, Epcot offered quiet, bee-filled gardens and imaginative floral recreations at every turn. It was a haven from the larger crowds and rollercoasters of the other parks. Disney’s Animal Kingdom was a lot of fun to explore – in part due to the fact a blushing pink sunset was taking place as we arrived. Housing one of the most celebrated rides within the Disney parks – Avatar Flight of Passage – this is a place dedicated to animal experiences and wild nature; even playing host to an African inspired safari and conservation station. Donning our ponchos, we rode the Kali River Rapids more than once, before jumping on one of our favourite rollercoasters: Expedition Everest (unexpectedly terrifying). 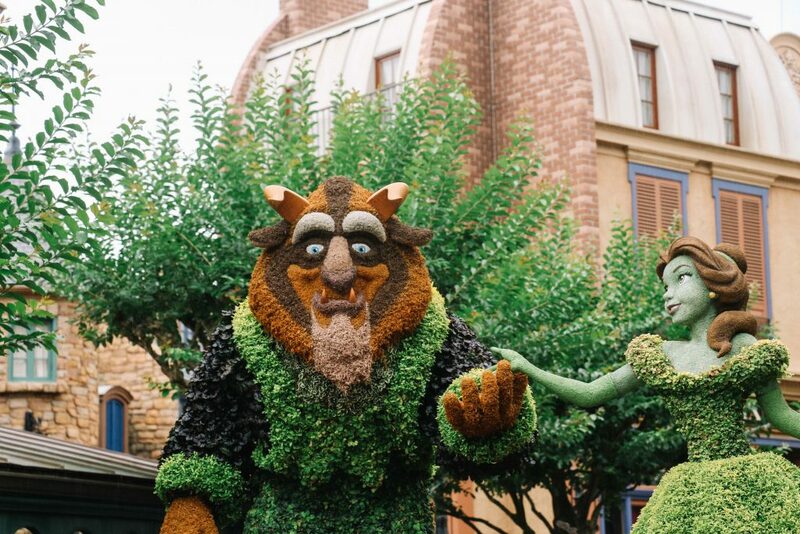 With such limited time in the parks, we knew we had seen just a fraction of what the Animal Kingdom had to offer and vowed to return in order to uncover every hidden detail. Yet with the light rapidly fading, we were keen to return to the Grand Floridian Resort, where we had booked dinner at Cítricos – a Mediterranean inspired restaurant offering views across the iconic Disney Castle. Dining on delicious fresh fish and crisp, Californian white wine (it’s not all cheeseburgers and soda at Disney), we watched as fireworks illuminated the spires of the castle, sending explosions of colour skywards. The scene was almost too perfect to be true – an image straight out of Fantasia – and I tried to absorb every moment of it. Disney’s Hollywood Studios was our final visit on our whirlwind tour of Walt Disney World. Home to some of the most recognised rides within the parks, we were eager to get our hit of adrenaline before we left Florida, homebound for the UK. 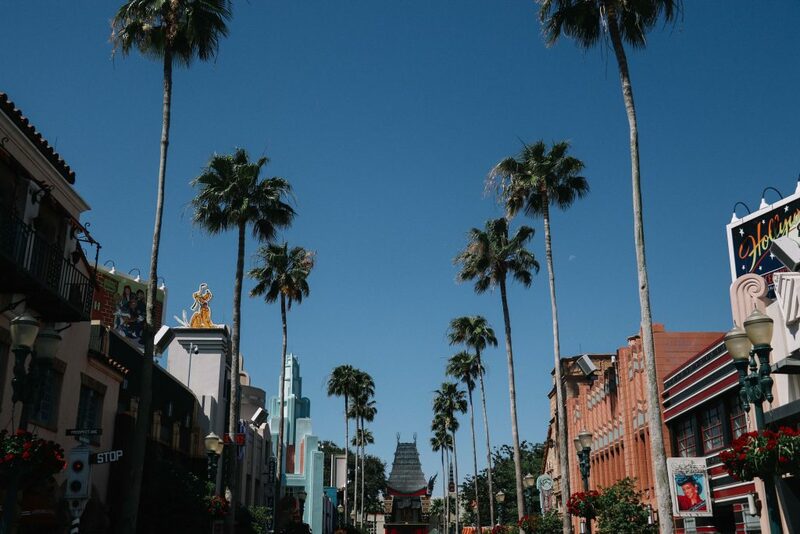 Arriving on Hollywood Boulevard – the entrance to the park – the glamour and excitement of golden age Hollywood radiated from the bustling shops and swaying palm trees. Overhead, a jet loop-the-looped, creating the word ‘Love’ in fluffy white lettering. 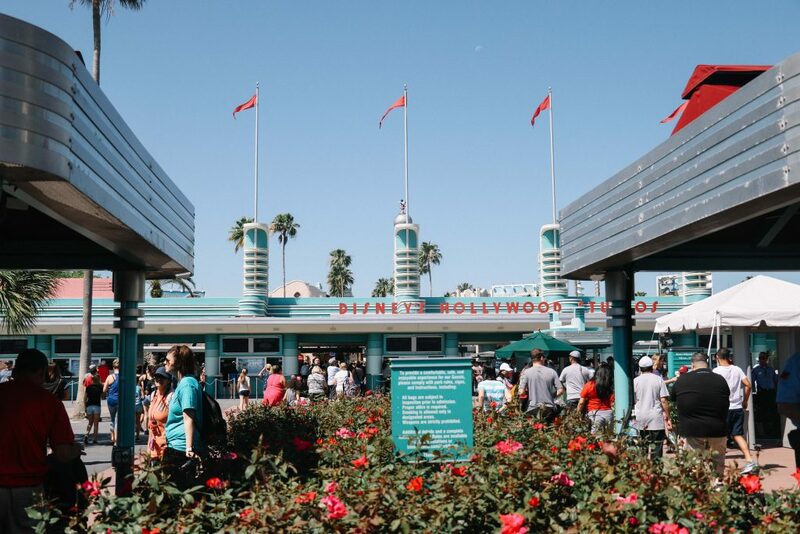 As nervous flyers, it was the perfect place to come to forget about our imminent flight home – disappearing into the world of Pixar, Star Wars and – surprisingly – Aerosmith. For adrenaline junkies, Hollywood Studios should be your preferred park – with two high speed rides and, come the end of June 2018, the brand new Toy Story Land, which promises to offer the brilliantly named Slinky Dog Dash rollercoaster. Predictably, our own final hours here passed in a blur, as we rode the Rock’n’ Roll Rollercoaster and formidable Tower of Terror. 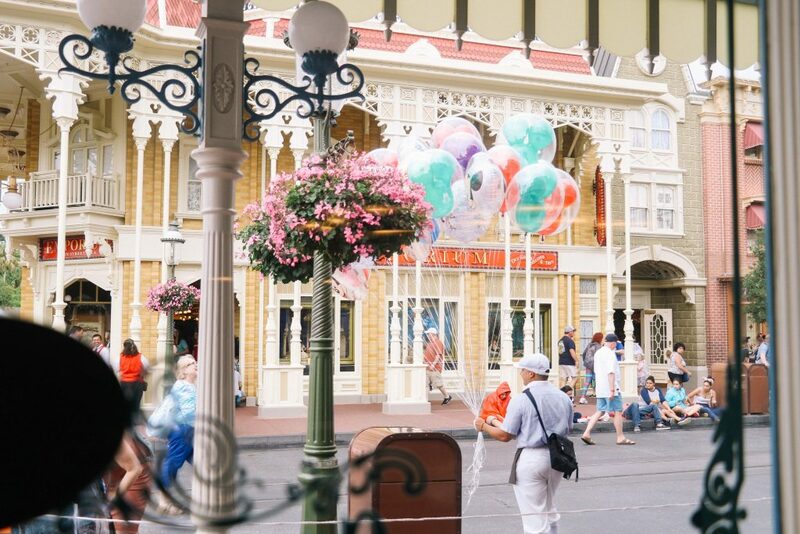 Clutching our co-parented Mickey Mouse balloon, I gazed out of our hotel window at the parks. Our time was nearly up in our Disney paradise and a lump was fast forming in my throat. Muttering about the injustice of it all (why couldn’t I fly home with a giant balloon? 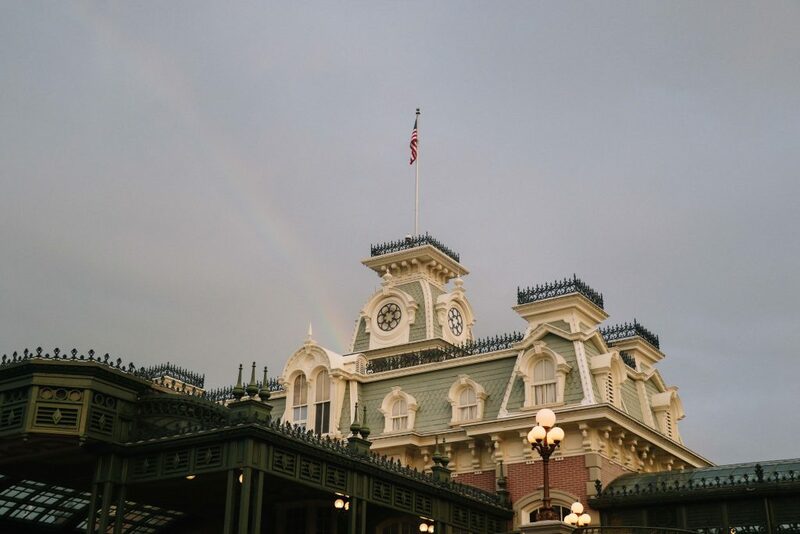 ), I walked backwards out of our room – desperate to take in every last moment of our magical time at the Grand Floridian Resort. Waiting for our flight home from Orlando airport, I reflected on our whirlwind weekend involving cowgirl antics and Disney adventures. 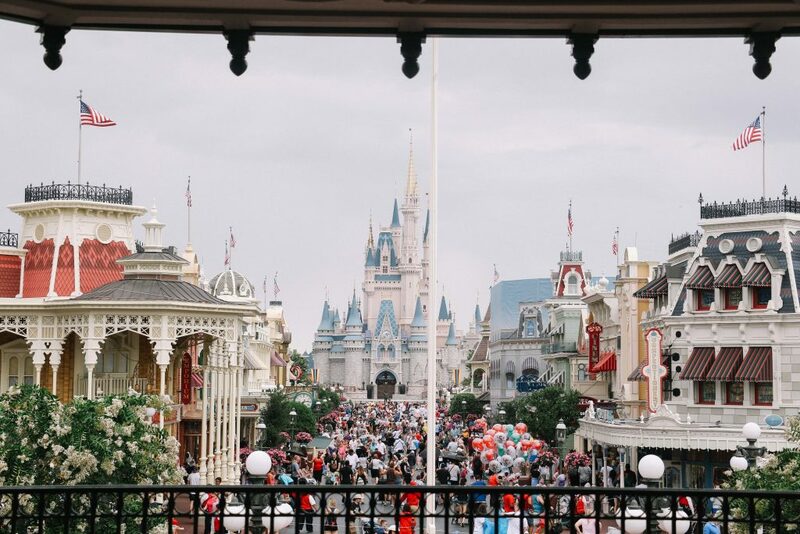 Traditionally, theme parks and fantasy worlds are seen as places best suited for children; yet I’m certain they are just as important for adults. Laughing uncontrollably as our rollercoaster plunged backwards, and dining with Lumière from Beauty and the Beast, our two days in the Disney parks remedied any of our adult woes. 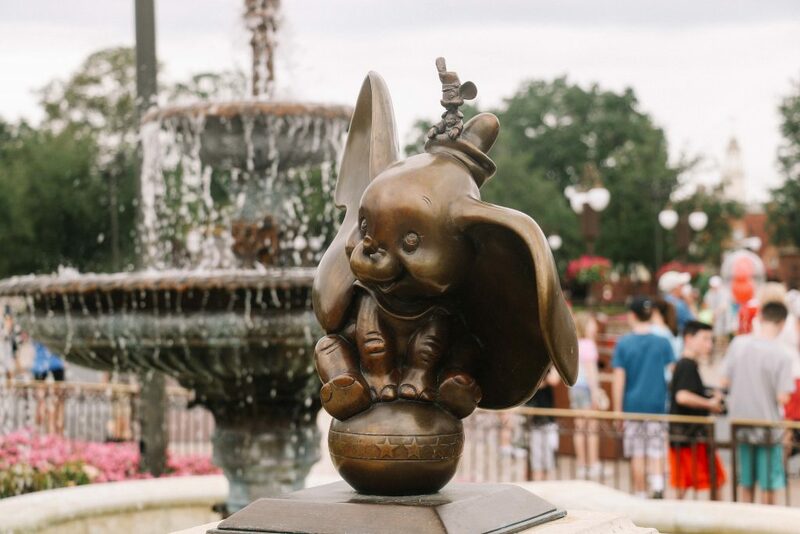 It may have been 25 years since I’d received my first (stuffed) Minnie Mouse, but the experience of walking through the Walt Disney World Resort was just as magical as I had imagined. In fact, perhaps even more so – a dream a few decades in the making now coming true. Indeed, in the words of Walt Disney himself: ‘all our dreams can come true, if we have the courage to pursue them.’ This was a Twins That Travel adventure that confirmed just that. 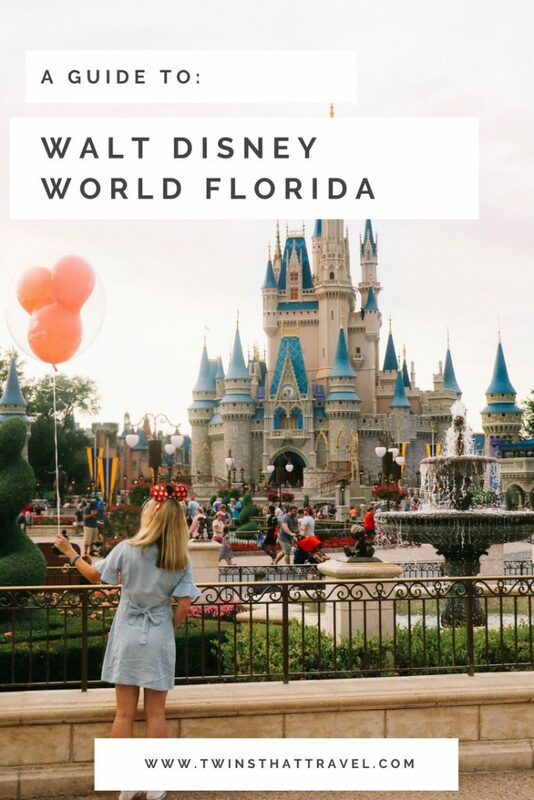 This is a sponsored post in collaboration with Visit Florida who kindly took us on our week-long Florida road trip and made our trip to Walt Disney World possible. "Sandals Grande Antigua: A Luxury Stay"
I would have been jumping for joy!! 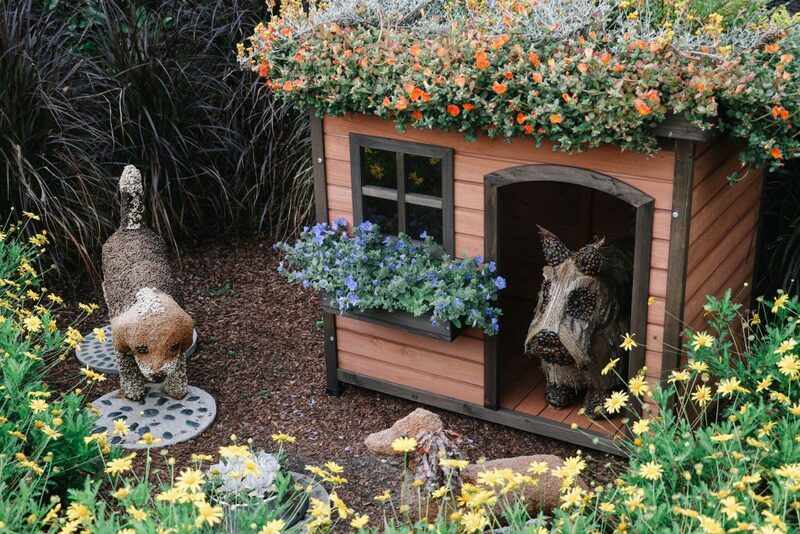 I love all the flower gardens! How fun! Your post has certainly inspired me to revisit a few of these places. Hi Katie! Aww I’m glad you enjoyed them too! It was a little frantic – we definitely need to go back for longer to truly soak it all up.